St. Brigid, Mary of the Gael (Irish: Naomh Bríd) (c. 451–525) is one of Ireland’s patron saints along with Saints Patrick and Columba. Her feast day is the first of February, celebrated as St Brigid’s Day or Imbolc in Gaelic Ireland. 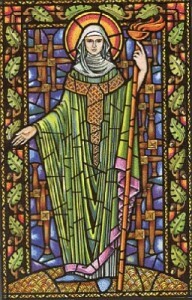 Saint Brigid is one of the few saints who stands on the boundary between pagan mythology, Druidism and Christian spirituality. Saint Brigid is the most famous female leader of the early Celtic Christian Church. 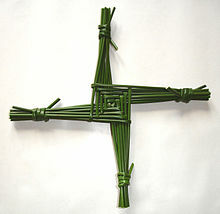 Brigid’s cross, Brighid’s cross, or Brigit’s cross, often with the “Saint” prefix, or (in the Irish language) Cros Bríde, Crosóg Bríde or Bogha Bríde, is usually made from rushes or, less often, straw. It comprises a woven square in the center and four radials tied at the ends. St. Brigid is known to be pure, sweet, lovely & gentle, thus reminding people of our Blessed Mother. The St. Patrick’s Parade Association of Lackawanna County encourages all to celebrate Irish Heritage by taking a moment to offer a prayer in honor of St. Brigid, during February, the month of her feast day.